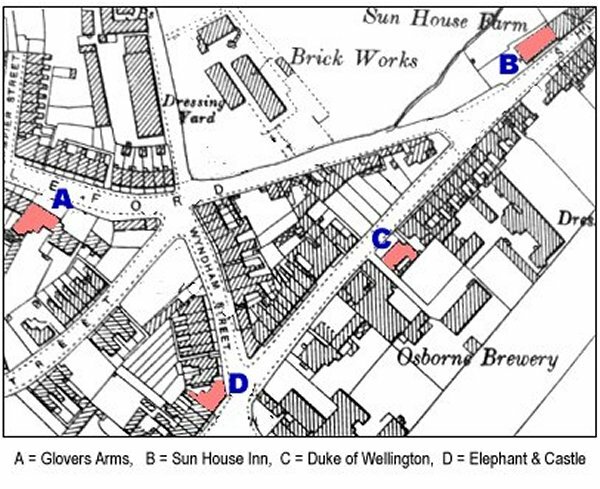 The Elephant and Castle Hotel (marked 'D' on the map below) was a purpose-built public house / hotel that opened in 1860 on the corner of Lower Middle Street and Wyndham Street. For interest - the original name "Elephant and Castle" is derived from a London coaching inn and the earliest surviving record of this name relating to the area appears in the Court Leet Book of the Manor of Walworth, which met at "Elephant and Castle, Newington" on 21 March 1765. Previously the site was occupied by a blacksmith and cutler – the coat of arms of the Worshipful Company of Cutlers features an elephant with a castle (most likely meant to be a howdah) on its back, which in turn was used because of the use of elephant ivory in knife handles. The folk etymology stating that "Elephant and Castle" is a corruption of "La Infanta de Castilla" - allegedly a reference to a series of Spanish princesses such as Eleanor of Castile - is, however, completely incorrect. 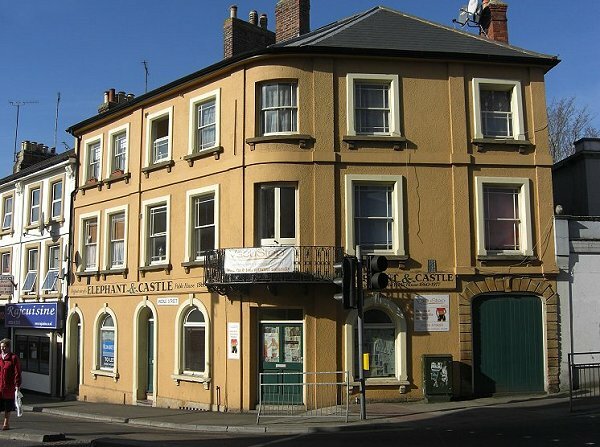 Yeovil's Elephant and Castle building is of three storeys, built in rendered brickwork under a Welsh slate roof. Wide string courses and wide, flat pilasters break the elevation into a visual grid pattern. All the windows have stone surrounds with corbelled cills, the windows to the ground floor only having arched heads. Two side doors, facing Middle Street have similar arched heads while the main entrance on the corner is surprisingly plain. Over the corner entrance the first floor has French doors opening onto an intricate wrought iron balcony. From the advertisement below, from the 27 January 1882 edition of the Western Gazette, it is seen that the inn contained a bar, smoking room, coffee and commercial rooms, ten bedrooms, good kitchens and offices. At the end of the building a low archway, or porte-cochere, with decorative stone surround and double doors gives the impression that it leads to stabling, which it may have done in the past, however because the Elephant and Castle occupies a corner plot the rear is wedge-shaped and very tiny so any stabling would have, by necessity, been to the side of the building. 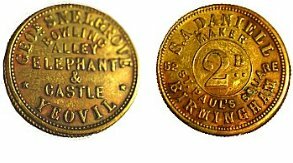 At left is a public house 'check' or trade token issued at the Elephant and Castle Hotel during the period George Snelgrove was licensee - roughly between 1871 and 1881. It is made of brass. The check is 23.7mm in diameter and with a milled edge. On the obverse it says "GEOE. SNELGROVE - BOWLING ALLEY - ELEPHANT & CASTLE - YEOVIL" and on the reverse is the maker's name "S.A. DANIELL MAKER - 52 ST PAUL'S SQUARE - BIRMINGHAM" and the check's value - 2D. At this time two old pence could buy you a pint of stout. Checks were frequently used in games, such as skittles or quoits where, for instance, players would 'chip in' a check to the 'kitty' which would be won by the winning team to redeem at the bar. By issuing checks a landlord could guarantee they would be spent in his establishment only. By the 1890s the Elephant and Castle was a tied house of the Royal Osborne Brewery, owned by Earle Vincent. When Vincent died in 1893 his estate was sold off the following year which included "the Elephant and Castle Hotel, let at £50 a year (about £5,000 at today's value)." MELANCHOLY SUICIDE - An inquest was held on Friday morning last, before Dr Wybrants, coroner, on the body of Mr Job Osment, who met with his death by jumping from one of the windows of his house. The inquest was held at the Elephant and Castle Hotel, the residence of the deceased. Sophia Osment, wife of the deceased, said: I am the wife of Job Osment. Have been married about 15 years. The deceased suffered much in his chest. I did not consider him responsible for his own actions. On March 31st deceased rose about 7 o'clock in the morning. He seemed very strange in his manner the whole of the day. He retired to rest about 2 o'clock in the morning of the 1st April. About an hour afterwards I heard a noise in the room. I jumped out of bed and perceived him in the act of creeping out of the window. I laid hold of him by the legs, and held him fast until my strength was exhausted. I could hold him no longer and he fell. I looked out of the window, and saw him groping about on the pavement below. I then called my father and brother, who were sleeping in an adjoining room, and they helped him into the house. Mr Tomkyns, surgeon, was immediately sent for, who had attended deceased for a week previously, and he immediately ordered him to be taken to bed. His face was much bruised, a rib was broken, and he sustained other internal injuries. William Stoodley, senr., cordwainer of Yeovil, deposed: I am the father-in-law of the deceased, and have known him for 15 years. The deceased has appeared very strange in his manner for the past two months. I was called by the last witness on the morning of the 1st of April, about 3 o'clock: I found the deceased lying on the pavement. With assistance I got him into the house. He was insensible. There was a great discharge of blood, after which he became sensible. He died on the Wednesday following, about 1 o'clock. Other witnesses were about to be called, but the jury considered the above evidence quite sufficient to prove that deceased had been of unsound mind for some time past, and they returned a verdict - "that deceased died from having thrown himself out of a window while in a state of Temporary Insanity." We may mention that the deceased was greatly respected, and his death is much lamented by the inhabitants generally. The deceased was interred in the cemetery on Saturday, when a number of Foresters of Court, "Yeovil's Pride" followed in procession, to pay a last tribute of respect to their brother member." The next licensee was George Snelgrove who was born around 1833 in Frome, Somerset, the son of Mary Snelgrove. By the time of the 1871 census George was listed as inn keeper at the Elephant and Castle with his Cheshire-born wife, Mary. According to Whitby's Yeovil Almanack Advertiser of 1878 George was also an Agent for the Licensed Victuallers' Tea Company. George and Mary appeared again in the 1881 census by which time his mother, Mary, was living with them. George Snelgrove was followed by the Williams family who also appear to have had something of a tragic tenancy - in 1889 James is recorded as licensee to be succeeded within a couple of years by his son David by 1891. David was to die in 1895 and the license was taken over by his widow for just a year. 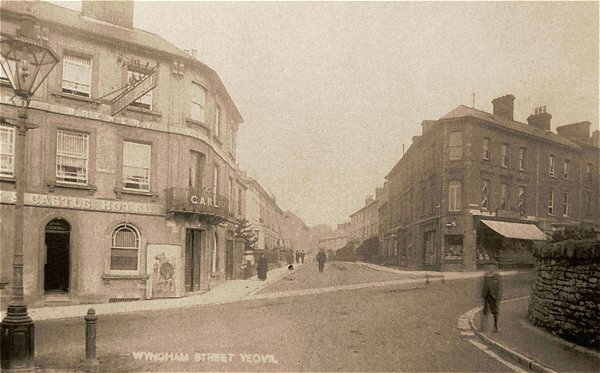 William Garlick was born in September 1867 in Yeovil, the son of Wiltshire-born leather dresser Tom Garlick and his Yeovil-born glove sewer wife, Mary Ann, née Mullins. In the 1871 census the young family is listed living in Victoria Buildings, a small group of houses at the bottom of Addlewell Lane built specifically to house workers in the gloving industry. Tom and Mary had married in 1866 but sadly Tom died in June 1871. Mary remarried and in the 1881 census was still living in Victoria Buildings, but with her new husband, Albert Fowler and his two children, while William was listed as Albert's stepson. William married in July 1893 and by 1901 was living in Earle Street with his wife, Eva. William was listed as a foreman glover and Eva was a glove machinist. By 1905, according to the dated photo below, William was the licensee of the Elephant and Castle where he was to remain until his death in 1923. Following William were only a few licensees and the longest-serving was Ernest Turvey who was licensee from 1939 until the mid-1950's. It is nice to see that all the licensees felt it necessary to highlight their 'well aired beds' in the advertisements at left. The Elephant and Castle closed in 1977 and is now offices. This is a sketch based on plans held at the Heritage Centre, Taunton. The original plans are dated 1970, when Bass Charrington (SW) Ltd were the owners. The scullery, various stores and toilets were all single storey lean-to buildings. 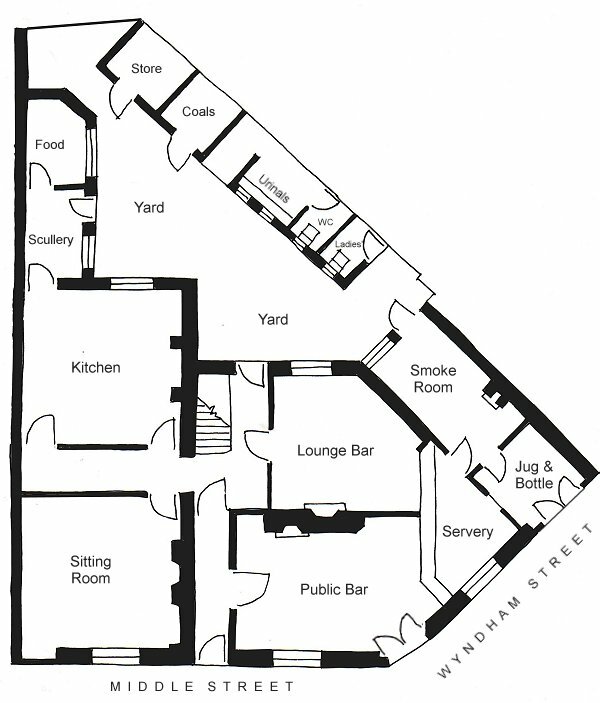 The first floor of the main building had a large lounge for hotel guests on the corner over the public bar and servery, three bedrooms, a bathroom and a separate WC, while the second floor had four bedrooms, a bathroom and a separate WC. The sitting room would most likely have doubled as a dining room for hotel guests. 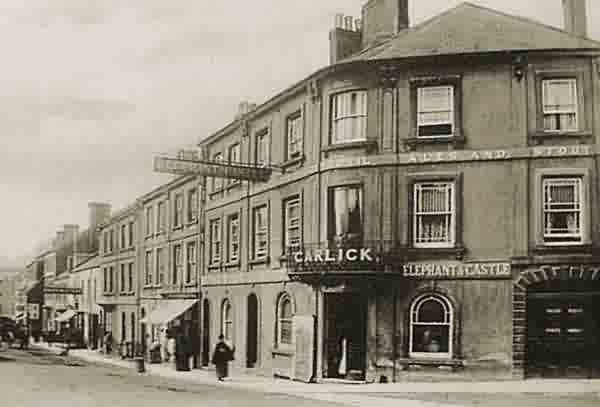 Photographed in 1905, during the period William Garlick was licensee, this view of the Elephant and Castle Hotel includes many neighbouring buildings in Middle Street that remain to this day. Wyndham Street photographed in 1905 with the Elephant and Castle Hotel at left and, at right the building of Clements & Sons Grocers & Wine Merchants building on this corner is now gone. Where the boy stands at lower right is the site where the Western Gazette office would be built in 1906. Note also at extreme left the three-light Sugg lamp. Photographed in 2012, the Elephant and Castle Hotel building has had a recent, and much needed, facelift - shame about all the tacky posters etc. in the windows and the equally tacky signage. © 2016 Bob Osborn. All rights reserved.